Sunday March 26th Is Omnivore Books' and Bar Agricole's Tipple & Snack Vintage Cocktail Book Fair and Party! Maybe you love cocktails. (If you’re reading this column, that’s likely.) 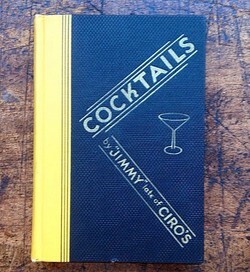 Maybe you love cocktail books, and even better, vintage ones. 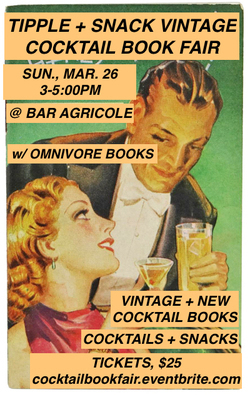 Well, on Sunday March 26th, you can have it all at Tipple & Snack, a vintage cocktail book fair and party courtesy of ~OMNIVORE BOOKS~, to be held on the fabulous ~BAR AGRICOLE~ patio. You’ll also be able to pick up a few of the fun tablehopper T-shirts featuring vintage San Francisco bars, from Tippy’s to Cross Roads, both as regular T-shirts and ultra-soft baseball tees. They’ll be just $20 each! This afternoon event is only $25; tickets here. Sunday March 26th, 3pm-5pm. Bar Agricole, 355 11th St. between Folsom and Harrison.